VATICAN CITY Pope Benedict XVI's onetime butler declared Tuesday he was innocent of a charge of aggravated theft of the pope's private correspondence, but acknowledged he photocopied the papers and said he feels guilty that he betrayed the trust of the pontiff he loves like a father. Paolo Gabriele took the stand Tuesday in a Vatican courtroom to defend himself against accusations of his role in one of the most damaging scandals of Benedict's pontificate. Prosecutors say Gabriele stole papal letters and documents alleging power struggles and corruption inside the Vatican and leaked them to a journalist in an unprecedented papal security breach. He acknowledged he photocopied papal documentation, but insisted he did so in plain view of others and during daylight office hours, using the photocopier in the office he shared with the pope's two private secretaries. The trial opened over the weekend inside the intimate ground-floor tribunal in the Vatican's courthouse tucked behind St. Peter's Basilica. Dalla Torre has said he expects it to be over within three more hearings. 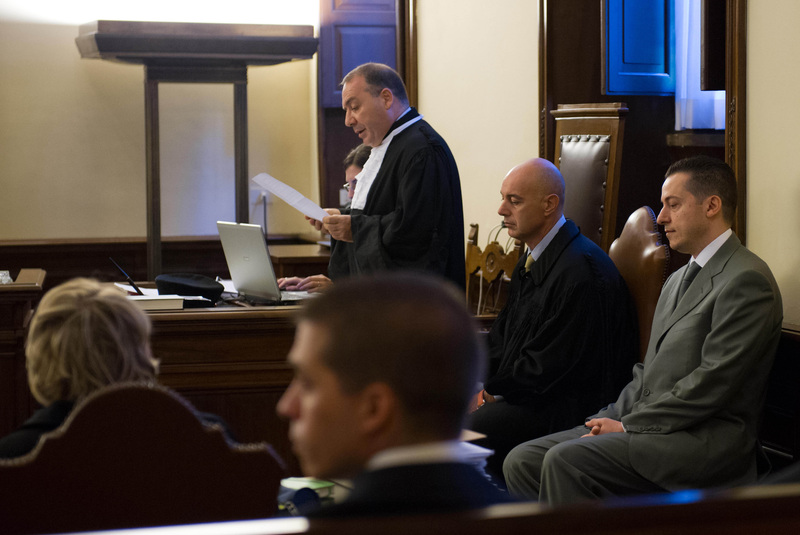 In addition to Gabriele, the court heard Tuesday from four witnesses, including the pope's main private secretary, Monsignor Georg Gaenswein, who along with Gabriele was the closest assistant to the pontiff. Gaenswein testified that he began having suspicions about Gabriele after he realized three documents that appeared in Nuzzi's book could only have come from the office he shared with Gabriele and Benedict's other private secretary. The book, "His Holiness: Pope Benedict XVI's private papers," became an immediate blockbuster when it was published May 20, detailing intrigue and scandals inside the Apostolic Palace. The leaked documents seemed primarily aimed at discrediting Benedict's No. 2, Cardinal Tarcisio Bertone, often criticized for perceived shortcomings in running the Vatican administration. Gaenswein said as soon as he read the book, he immediately asked the pope's permission to convene a meeting of the small papal family to ask each member if he or she had taken the documentation. One member, Cristina Cernetti, one of the pope's four housekeepers, told the court she knew immediately that Gabriele was to blame because she could exclude without a doubt any other member of the family. In an indication of the respect Gabriele still feels for Gaenswein, he stood up from his bench when Gaenswein entered the courtroom and then again when he exited. Gaenswein didn't acknowledge him. The trial resumes Wednesday with the testimony of four members of the Vatican police force who conducted the search of Gabriele's Vatican City apartment on May 23. In testimony Tuesday, two police officers said they discovered thousands of papers in Gabriele's studio, some of them originals.